Join our amazing Ambassador Program and bring Crayon Collection to your city! Crayon Collection operates out of Los Angeles, but with the support of our amazing Ambassadors, our reach is international, benefitting children in the US, Australia, Africa, Asia, Haiti, Guam, South America, the UK and beyond! 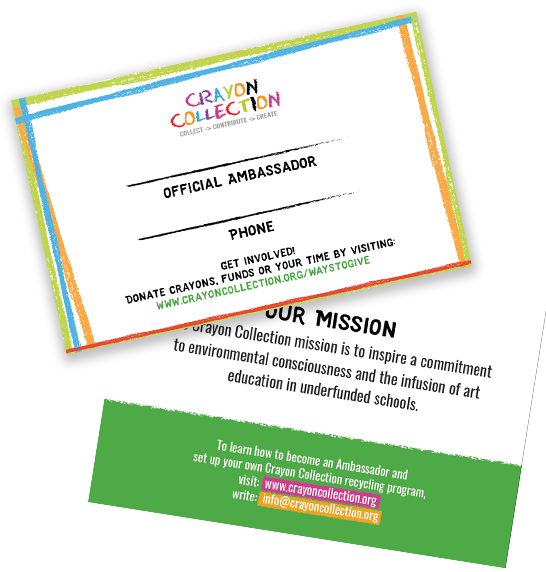 Ambassadors receive official Crayon Collection calling cards that they can personalize in order to start the conversation at area restaurants and businesses.